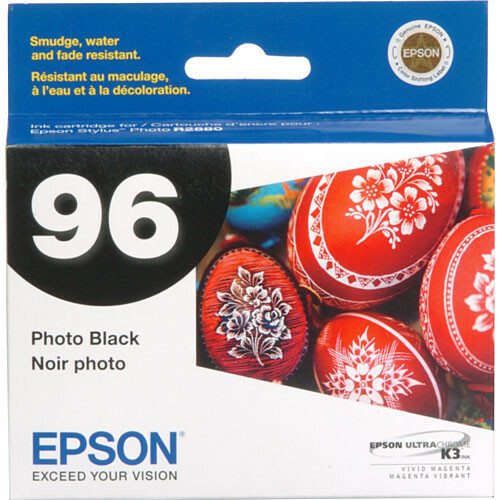 The Epson 96 UltraChrome K3 Photo Black Ink Cartridge is part of a professional ink set for the Stylus Photo R2880 Printer that includes advanced magenta pigments to makes it easy to achieve exhibition quality prints with more dramatic blues, purples and reds. This pigment ink set also offers impressive color stability immediately after printing, and provides print permanence ratings of 200 or more years for truly sellable color and black-and-white prints. Box Dimensions (LxWxH) 4.45 x 4.4 x 1.15"
96 UltraChrome K3 Photo Black Ink Cartridge is rated 4.8 out of 5 by 43. Rated 5 out of 5 by Anonymous from I will buy this product again and again I have an Epson R2880 and never thought I would use anything other than Matte Black, because I love the look of the Matte paper. But decided to try using the Photo Black with a Photo Luster paper. Wow! With this particular brand paper and the 2880 inks, the results blew me away! I am preparing photos for a local show and looking forward to it. B&H has by far the best price for this ink. Always pleased by my purchases, quality help from knowledgeable people and with prices that make it easier to keep taking pictures and printing them. Rated 5 out of 5 by John from AS GOOD AS IT GETS I USE THIS EPSON INK (AND ALL THE OTHER COLORS REQUIRED)TO RUN 13x19 PRINTS IN MY R2880. THERE ARE REPORTS ABOUT THE INK NOT LASTING LONG! BUT FIRST YOU HAVE TO REMEMBER IS THE OVER ALL SIZE OF A 13x19 PHOTO! 247SQ IN. TO A 8.5x11 OF 93.5SQ IN. LARGER PAPER = MORE INK! YES I DO WISH THE CARTRIGES WERE LARGER BUT THIS PRINTER AND THIS INK ARE GREAT!!!!! Rated 5 out of 5 by Anonymous from i love this product! i use this product for my printer. this product is great for my bright photos. it is very durable. Rated 5 out of 5 by ticebass from The only ink I use I use the K3 UltraChrome inks for printing enlargements in my photography business. Rated 5 out of 5 by Anonymous from Good ink, small cartridge Easy to install, prints great but it would be great if they came in a larger size. Rated 4 out of 5 by Photos_Obscura from Excellent Ink Great tone and range on archival paper. How much ink is in each 96 cartridge?